We haven’t run a good, old-fashioned contest in a while, so it’s time! We’re going to try something new (to LibraryThing) for this one: it’s a virtual Edible Books Contest! 2. Take some photos of what you made. 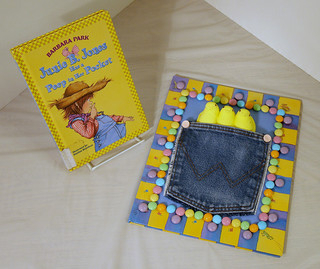 The photo at right is one of the entries from the Topeka & Shawnee County Public Library’s Edible Books Festival (see more of their photos here). 4. When adding the image, tag it “EdibleBooks2012″. This will add your image to the contest gallery, and counts as your entry into the contest. If your photo doesn’t have the tag, we won’t know that you’ve entered. You’ll be able to see all the entries here. 5. Tell us about it in the “Title/description” box. Deadline: Add your photos by 4 p.m. EDT on Thursday, May 10. Fine Print: You can enter as many times as you like, but you can only win one prize. Your dish must be made of edible ingredients (no hats, lost-wax sculptures, performance art), and by entering the contest you certify that it is your own creation. All decisions as to winners will be made by LibraryThing staff, and our decisions are final. LibraryThing staff and family can enter, but can only be honored as prize-less runners-up. Any images you load stay yours, or you can release them under a copyleft license, but we get a standard “non-exclusive, perpetual” right to use them. * We thought about having everyone send us their dishes for judging (and tasting). But we decided they might not hold up to mailing well, and that our waistlines probably couldn’t handle it! Does the picture of the edible dish have to be accompanied by the book itself? No – you can add that if you want, but it’s not required. That is a totally cute idea! I won’t have time to meet this deadline, but I’ll look forward to seeing the winning entries. I did this with a team years ago in Chicago, it was such fun to see all the entries. I’m looking forward to seeing these new ones. It is an awesome post.